Identification: White, ribbed masses that hold up to 800 red eggs. Nymphs are red with black legs and antennae. 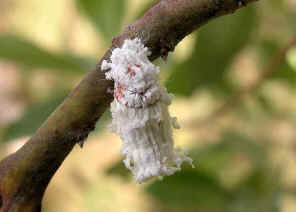 Adults are covered in white hair. Biology and Life Cycle: Three generations per year; overwinter in all three stages: adults, larvae, and eggs. Habitat: Apples, apricots, camellias, citrus, figs, peaches, pecans, peppers, potatoes, quince, and walnut and maple trees. Feeding Habits: They attach themselves to and feed on leaves and stems. Economic Importance: Damage to stressed ornamentals and food crops. Natural Control: Ladybugs, especially vedalia and Australian ladybugs. Organic Control: Spray dormant oil in late winter before spring. Spray horticultural oil, if needed, year round. Apply mixture of manure compost tea, molasses, citrus oil. Garlic-pepper tea also helps. 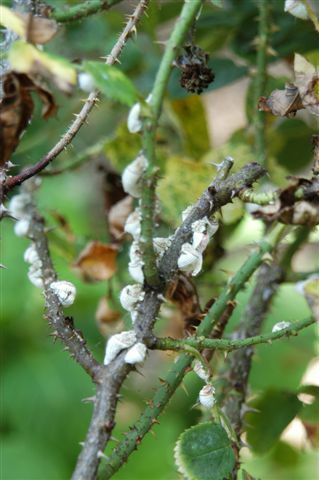 Insight: Sometimes confused with mealybugs. ANSWER: Beneficial insects that target specific pest insects may work, and they often are the best option because good insects won't be hurt. If that fails, my formula for fire-ant mound drench, used as a spray, should kill the cottony cushion scale insects. For long-term control, try to figure out why your shrubs are in stress. They would not have this pest if they were healthy. Causes of stress could include too much or too little water, poor drainage, compacted soil or the use of high-nitrogen fertilizers.